I was surfing the web recently and came across a lovely site that features a wonderful collection of Christian and other inspirational jewelry. The site is called "The Bell Collection by Jewelry John." I love the description he gives on his home page, along with a single silver bell - Our beautiful silver bells have touched the lives of both those who have given and received them. The gentle ring of a silver pendant can evoke our deepest sentiments and remind us of all we hold dear; faith, family, love and friendship. 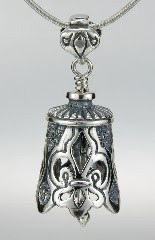 His bells are made in a twelve step process that uses the finest sterling silver and gold alloys. He says that they are truly heirloom quality. 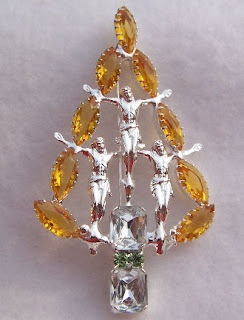 The site also has a wide range of other types of Christian jewelry including cross necklaces, bracelets, and earrings. I love well made religious jewelry, particularly vintage spiritual jewelry. My website Vintage Jewelry Lane also has a lovely range of vintage religious jewelry. One of my favorites is this stunning contemporary piece from Rhode Island Designer Ron. It features a wonderful large Christmas tree design with the figure of Jesus in the center of the Tree. Prong set rhinestones completes the design. What a lovely, inspirational gift this would make for only $39.99. When someone admires your vintage jewelry and asks what period it comes from, are you stumped? Here is a quick guide to dating pieces that are truly vintage. Basically antique jewelry is any piece over 100 years old and vintage jewelry is considered as that dated between 1940 and 1980, but there are various periods in each of the two classification. Georgian Jewelry (1714-1837): This jewelry was most often handmade, so that each unique piece varied in quality, depending on the maker. Georgian jewelry often featured shapes from nature, such as birds and flowers. Jewelry from this period included precious and semi precious stones such as garnets, diamonds, coral, and topaz. Georgian jewelry is very rare and highly collectible. Early Victorian Jewelry (1837-1850):Jewelry from this period, like Georgian, often reflected nature based designs which were commonly etched in intricate gold filigree patterns. Lockets and brooches were very popular during this time period. For evening, one would often wear gemstones or diamonds. Mid-Victorian Jewelry (1860-1880): This period coincided with the death of Queen Victoria’s husband, Albert, when she went into a period of mourning for him. Many jewelry pieces from the this Mid Victorian period had a more subdued, austere, and somber design. Mourning pieces made of black jet, onyx and deep red garnets abounded. This period also resulted in different ways of using gems and metals, which resulted in much bolder and more colorful designs. Japanese themes were popular in this period. Late Victorian Jewelry (1885-1900): This was an aesthetic period of jewelry design, with feminine colors and a big use of gemstones. Hat pins were especially popular as fashion accessories. Arts and Crafts Jewelry (1894-1923): The industrial Revolution, with the advance of mass technology inspired designers of this period to return to intricate craftsmanship in their designs. The jewelry was colorful with simple patterns. Art Nouveau Jewelry (1895-1915): The graceful Art Nouveau period started with designers in France and those in America following suit. Look for graceful flower designs with an abundance of dragonflies and other insects. Edwardian Jewelry (1901-1910): After the death of Queen Victoria, the Edwardian era was ushered in when her son Edward took the throne. This was a lavish period with pearls and diamonds in jewelry with emeralds, rubies and other gemstone accents. Highly decorative and elaborate period. Art Deco Jewelry (1920-1935): This was a period of bright colors in contrast to each other, as well as a preponderance of geometric shapes and very strong lines. Look for Egyptian, Japanese and African themes. Bakelite and celluloid became very popular too. Retro Jewelry (1940s - about 1980): The jewelry from this period was elaborate and colorful with an array of gold and gemstones. It had Hollywood for its inspiration, so the retro jewelry was somewhat larger than life in style. This was a period when charm bracelets became a favorite jewelry item. I will cover these periods in greater detail, with photographs, in later blog entries, but this should give you a general idea of the various time periods. Collecting Vintage Jewelry - part 2 - What is the condition? As promised, I am continuing my series of articles on how to go about putting together a collection of vintage jewelry that you will be proud to wear and, hopefully, pass on to your heirs. The second thing to consider before you purchase a piece of vintage jewelry is the condition of the piece. In retail marketing, the keywords are "location, location, location." For collecting vintage jewelry, I have similar keywords - "Condition, condition, condition." Check the jewelry piece carefully. Are there any missing, cloudy or dead stones? Is there excess glue around the stones, or has it yellowed with age? It is possible to replace stones in vintage jewelry, but this will affect the value of the piece and should be professionally done - not always synonymous with having it done by a professional, but usually they are one and the same. Check the piece for verdigris. This insidious green gunk will form in many places, especially those which are worn close to the body - clasps on necklaces, and earring backs are the main cuplrits, but you can also see it on any metal parts of a piece of jewelry. If you see green gunk, you are seeing damage. Verdigris can be cleaned but the piece is not as valuable if it has it or has had it in the past. Check all clasps and other working parts to make sure that they function well. 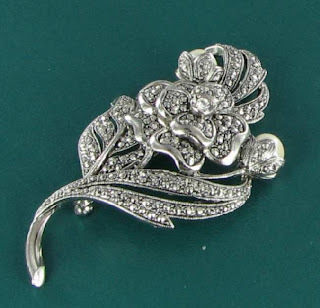 No matter how pretty the stones in that vintage brooch are, it's not a good investment if the clasp is broken. If the set of cuff links have "to die for" construction and design, but one of the pair has a wonky link - it shouldn't be intended for the investment pile. Be sure to examine the condition of the metal. Don't purchase those pieces with serious metal wear - whether it be flaking metal paint, cracks or broken joins, or a greenish tinge to the metal. If the piece only has slight metal wear on the back side, it can be a piece to buy, as long as it is interesting in many other ways. So, step two is really pretty simple...just inspect the piece carefully for damage. Be sure to check back soon for the next chapter. The knot - a symbol of permanence. One of the new fashion trends for jewelry in 2009 is the use of knots in jewelry. In ancient heraldic symbology, the knot stands for longevity, commitment and permanence. Knots have long been used in jewelry of all types. Pictured here is a wonderful Sarah Coventry vintage ring. The design is aptly called "Lover's Knot." The ring features a creamy faux pearl in a goldtone knotted setting. Priced at only $11.99, it would make a wonderful Valentine's gift for the love in your life. Vintage Jewelry Lane has this item for sale. You can see more pictures and details here. I love glass jewelry - just love it. It has a heavy, cold aspect to it that gives a wonderful feeling when worn. Even just holding it in my hands makes me feel as though I have a piece with value because of the weight. Vintage Jewelry is known for using glass beads and glass stones. Modern contemporary jewelry uses them too, but many modern pieces use lightweight plastic stones which just don't have the same feel to them. The good news is that glass jewelry is still relatively inexpensive to purchase. It is gradually going up in price, but there are many pieces that can still be had for decent prices. Glass jewelry can be found in a myriad of designs. Look for brooches with glass cabochons as the main feature of the design. Many are open backed and some are handpainted. Necklaces can feature glass in combination with other beads such as lucite or faux pearls, or can be all glass as the case with many crystal clear aurora borealis faceted bead necklaces. One of my favorite types of glass pieces is called "Milk Glass." 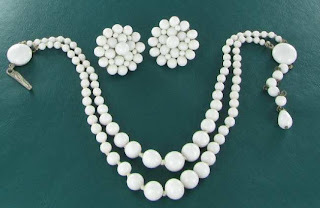 It has the weight of normal glass beads, is pure white and can be either smooth or faceted. It is used in many early German and Japanese pieces. The set featured here is a stunning two strand necklace with matching earrings from Japan in a wonderful design with handknotted milk glass beads. The set is available for only only $39.99 from my Vintage Jewelry Lane website. It would look just perfect with an all black outfit! If you are like me, you have normally bought your jewelry in retail stores but then you were at the flea market, or on ebay, and you saw a pretty vintage piece and bought it. Or you had an older relative die and you were given a few pieces of vintage jewelry from their estate. Once that happened, you were hooked. New jewelry didn't seem as interesting or well made and you were off looking for more of the "past treasures." You are intrigued, but there is so much choice. Where do you even start? Over the next few weeks, I'll be writing a series of short articles which will give you some advice on a step by step progression which will guide you in your new passion to put together a lovely collection of vintage jewelry that you will be proud to wear and (perhaps) pass on to a family member. 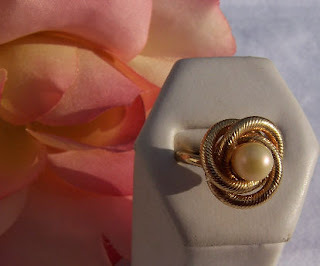 Today's blog will talk about the #1 reason to purchase a piece of vintage jewelry. Forget about hallmarks, age of piece, construction design and the like Your first question to yourself should be: "Does this piece appeal to me? Do I like it?" In my opinion, the overriding factor is...if you like it buy it. It doesn't matter if it is perfect. If you like it, it should become yours. Most pieces of vintage jewelry can be repaired or cleaned and polished so that it looks more presentable. I have sold large collections of vintage rhinestone jewelry in my ebay store, Carolina Collections Vintage jewelry, time and time again, with lovely pieces that need to have rhinestones replaced, or that have small enamel problems. There is always someone who sees a piece or two in the collection that they just love and want and are willing to put some time into the problems with the a lovely piece of vintage jewelry. Perhaps the piece is in need of a LOT of elbow grease to get the metal back into good condition. I've had pieces just covered with the dreaded green junk called Verdigris, which I have restored to like new condition with just a few steps and commonly found household materials. Don't know how to repair vintage jewelry? See my website, Vintage Jewelry Lane, for a great article which deals with various aspects of repairing and restoring vintage jewelry. In any case, whether the piece needs repair or is in perfect condition, the first thing to consider is: Do you like it? Be sure to check back soon for the next installment of this article. Before long, you will have a collection of vintage jewelry which will reflect your own personal tastes. You may even be able to convince one of your friends to "get hooked" on vintage jewelry too! Brooch, broach, pin...call it what you will. This piece of vintage jewelry has been popular through the ages and is a very sought after accessory right now. They used to be worn on a knit sweater, but lovers of this piece of jewelry have discovered all sorts of new ways to wear them now. Do you have a plunging neckline on your favorite party dress? Pop a rhinestone pin in the cleavage for a breathtaking effect. Have a simple jacket that you wear to work? Add a brooch to the lapel to dress it up for evening. Here is a cute idea I saw when shopping the other day: one lady had a vintage brooch on a soft fabric purse. My daughter puts pins on her wide belts and they look very trendy. You can take a piece of soft fabric and tie it as a belt and add the brooch to the knot area to make a wonderful 3D belt. Tie up your favority big scarf and put the pin on the shoulder area to draw attention to the face area. There are so many possibilities. Let your imagination run wild. If you are not a dress up type of gal try adding several pins to a jean jacket. Be creative! Vintage Jewelry Lane has a wide choice of brooches and pins from all eras. The pin I've shown today is one called "Fashion Splendor" from the Sarah Coventry Collection. It is from the early 1970s and is in wonderful condition. The site has of Rhinestones pins, designer brooches from popular designers such as Sarah Coventry, Weiss, BSK, Eisenburg, Art, etc, even Italian Micro Mosaic pins and Cameos. There is something for all tastes. BIG Bold necklaces are in! I was Christmas shopping with my daughter yesterday at the mall and spent some time in the jewelry departments seeing what they are offering for necklaces this year. One trendy boutique had a whole window display of just necklaces. The styles were all very big and bold...either with huge beads or with large areas of dangles. The styles were almost like a throw back to the 1980s, but with more interesting beads and stones. Here is an example from my Carolina Collections Vintage Jewelry ebay store of a style similar to some of those with the big dangles. 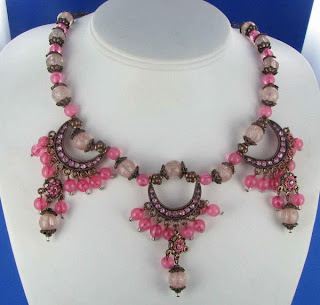 It's a very pretty pink rhinestone and lucite festoon type necklace with lovely pink lucite crackle beads. It's a bargain for only $16.50! You can click the picture to go to the listing page. Cartouche, French Jet, Gilloche, Intaglio - what they heck does this mean? Art Deco, Edwardian , Art Nouveau - to what time period does this refer? Are you often confused with jewelry terms, time periods and other jewelry information? Well, you are not alone. Many jewelry collectors know basic terminology, but are stuck when it comes to more obscure terms. I was also out of touch with many terms and other bits of information, so I started researching for myself anytime I came across a word that I had never heard before. I have added a research article to my vintage jewelry website to help out fellow jewelry collectors. Vintage Jewelry Lane has a wonderful Jewelry Glossary with hundreds of basic and more obscure jewelry terms - all neatly arranged in alphabetical order for ease of finding the information you need. The glossary deals with mainly terms pertinent to vintage jewelry. Check back later for more glossaries dealing with gemstone identification, costume jewelry information and others. The holiday season is here. You've picked out your party dress. Now, to accessorize for just the right look for this year's holiday parties. Vintage rhinestone jewelry is perfect for accessorizing any festive dress. It is relatively inexpensive compared to the department store counterparts, and is very well made - often with glass stones and crystals that sparkle along with the holdiay decorations. 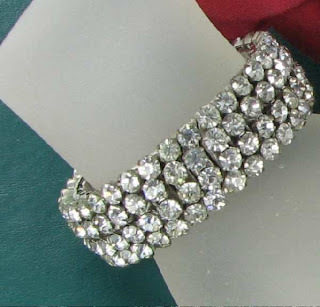 This rhinestone bracelet features tons of prong set rhinestones in three rows of glitz and glam. It expands to fits most wrist sizes and is just stunning. Elegant, classy and to die for. Imagine this black rhinestone necklace making a statement at your next holiday party. Rhinestone Dangle Earrings are the perfect finishing touch for a festive party look. They come in an array of colors and styles, from simple drops to long chandelier style to suit your taste and mood. 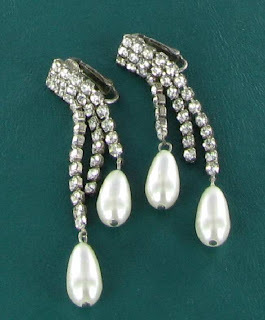 This pair also has pearl dangle for a touch of romanticism. 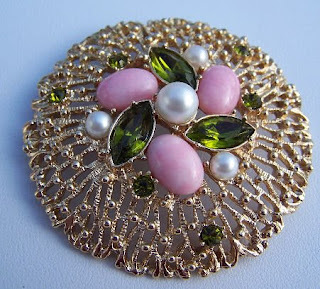 See the complete range of rhinestone vintage jewelry at Vintage Jewelry Lane. Welcome to the Collecting Vintage Jewelry Blog! I am very excited to announce the opening of the Collecting Vintage Jewelry Blog. Be sure to bookmark this page for a wide variety of topics under the broader heading of vintage costume jewelry. Some topics may include designer hallmarks, current fashion trends, design details, and some of our lastest finds. My name is Carol and I am the owner of vintagejewelrylane.com an online source for vintage costume jewelry. My site has all types of vintage costume jewelry, but we specialize in Sarah Coventry jewelry, cameo jewelry, micro mosaic jewelry, butterfly jewelry, and damascene vintage jewelry. I'll start off this blog with our vintage jewelry word of the month - Marcasites. Marcasite is a type of stone, often used in sterling silver, and sometimes faceted - this mineral has the same composition as pyrite (fool's Gold) but has a different chemical structure. It is a gunmetal gray color with a shiny finish and is inserted in the same was as a rhinestone is. The stone sometimes acquires a multi-colored tarnish that is the result of oxidation. The stone has a luster and is opaque. Occasionally, a sulfur smell is detectable. See more information and pictures here.